The most avoided event for young boys and perhaps girls as well was the looming of the haircut. That’s why I cannot remember this ever happening when I was very young. I am sure it was done and most likely by my mother or perhaps even dad. There were vague references to a terracotta flower pot being used to snip around the perimeter after it was placed on the hapless victim. Money was scarce and seen as a waste spending it on kid’s hair. Adults would go to a barber and a women’s hairdo were referred to in French as in coiffure or bouffant to give it a special and heightened sense of feminine importance. With men it would be a shave and a cut. A flick knife with a frighteningly long blade would be sharpened in front of the victim on a leather belt before the stubble or beard would be tackled. You would not want to have a violent disagreement with the barber and politically savvy positions would be taken at all times. The barber would politely ask ‘brush good and warm today, Sir?’ The reply was always a mumbled, ‘yes, very nice and warm.’ The brush would be soaped up in warm water and rubbed around the palm of the barber’s hand or a special dish to get a nice lather, not too sloppy nor too firm. There were skills involved that seem to have got lost. However, my last haircut a few days ago, those lost skills were re-discovered. I had held off as long as possible but after Helvi’s remark I looked like a Hottentot, I felt I should really get a cut, especially as our fiftieth marital milestone had been reached. I decided to try a new barber shop. It looked rather snazzy and had a computerised system with special rewards for loyal customers. Now-a-days, any business has to have some gimmick and what more gimmicky than having some connection with the electronic world, especially a computer. I punched in my name and phone number. Out came a ticket with a number and I sat down waiting for my turn. I was immediately struck by the performance of one of the cutters. He was hair cutting enthusiasm incorporated. He had a dark complexion and with a full head of pitch black hair, always a major plus in my opinion. I mean a bald hairdresser doesn’t quite cut the mustard in the world of hair. I don’t know why; perhaps an odd prejudice on my part? He displayed a barber agility I had never seen before except perhaps in the world of gymnastics or even ballet. He danced and jigged around the man he was haircutting. The amazing part was that the customer did not have much hair to cut. He was an elderly gentleman of slim proportions with the only hair available at the back of his head creeping towards the lower part of his neck. Even so, the hairdresser was clicking his scissors as if approaching a fully fleeced Merino. The customer’s wife was sitting next to me, giving gentle instruction to this dancing and swiftly darting about hairdresser who, in full flight, was giving every strand of his remaining hair full and undivided attention. I could not wait for him to do my hair. I was fully rewarded. 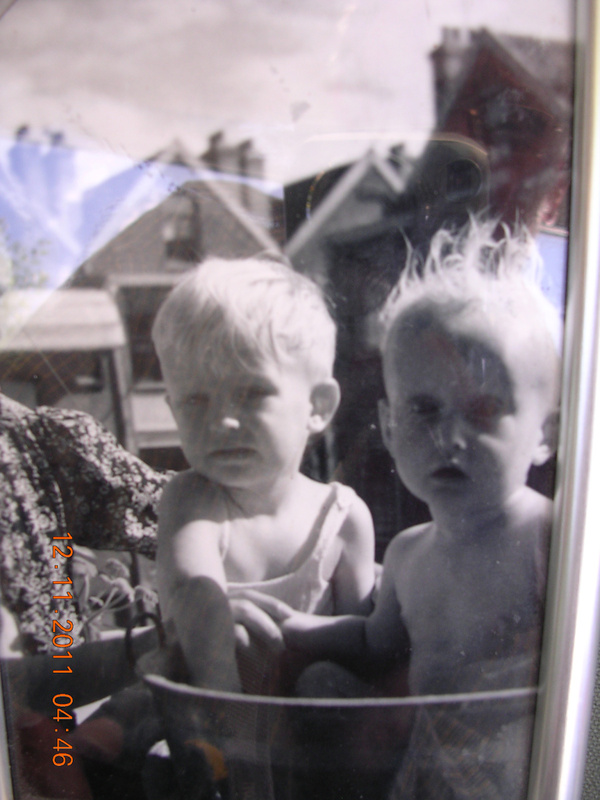 He was overjoyed to work on my still fully bouffant head of hair and soon got in his stride. Fever pitch would be an understatement. It turned out his darkness was not Spanish but originated from a Philippine mother and Australian father. He learned his considerable skills on the job and did not go to a technical college. Towards the end he rubbed some fragrant pomade between his hands which he did by holding them above my head. I felt I was getting some kind of laying of hands, it was almost religious. He looked at my head and turned it a bit here and a bit there, almost like an architect contemplating a new opera house on the banks of the Danube at Bratislava. He finally rubbed it on my hair, gave a sigh of utter satisfaction and was finished. I must say it was the best haircut I ever enjoyed. An improvement on the terracotta job of so many years ago. I’ve been going to a hairdresser rather than a barber since I was about 10. Went into one who took about 1mm off and mother went apoplectic. Back then one had a flowing mane, nowadays its approaching the horizontal mohican. Gez, I regard going for a haircut as I would a visit to the proctologist, a pain in the arse. I have invested in fairly good quality cordless clippers, now that my hair is thinning. Fortunately it requires little skill, just running the clippers all over my noggin in a random fashion, likewise the beard. I too remember the Saturday morning trips to the barber, five bob in hand, and the oft repeated chant in my mind, ‘short back and sides, thanks’. In my late teens I had quite long hair, a ‘long haired git’, as my father described me. One day he’d had enough, so took me to an Italian barber in Manly, to ‘bloody well sort you out’. The son of the barber leaped onto that wonderful head of hair with new techniques he’d picked up from the old country. Dad was very disappointed that he had removed exactly six mm all round! Great writing Gez, you can make a trip to Aldi’s sound like a voyage on the Golden Hind! Love your writing Gerard – it is so alive and I always feel I am in your mind or there with you in your observations. I remember that boys’ haircuts in particular (back in the 50s) were very ordinary and I think a few were home jobs but I have never been able to imagine how a pot of any kind would actually be of assistance. Now, I am a rare one. Except for a few years (including an experiment with a perm) I have cut and styled my own hair ever since I was about 14. I still do it. I get compliments. My daughters’ hair was also cut by me. Both never went to a hairdresser until we decided on tips and something extra for the highschool ‘graduation’ do. Daughter No.1 has returned to my hairdressing salon (in the bathroom) for the last two years. She could never find anyone to actually do it ‘right’. She too gets compliments and has been asked on a number of occasions who cuts her hair. I’m not a hairdresser by trade. It’s just that only I could get me right ! I also do my husband’s beard – used to do his hair too but with so little of it left he now shaves his head. Actually I would like to be pampered and have mine cut by another person but I am just too scared ! PS – I did get my hair cut once in England at Vidal Sassoon – just for the experience. Thanks Viv, your words are greatly appreciated. I will try and give the P/A more pieces, now that peace has returned. You do your husbands beard. I’ll tell Helvi about that one! I cut my own with an electric trimmer. It goes all around and I keep it short. When travelling overseas customs now switches electric items on, proving they are not bombs. I arrived with the shaver flat as a tack. I have a steady hand and a good eye for balance and making it look good. When he had a full beard I did once draw blood from his ear lobe ! Ah well, no one is perfect. You could have taken his whole ear and done a Vincent. Did he swear or took it like a man? He overreacted. I said it is just a teeny weeny snip and don’t be a wimp. I also said that will teach you to sit still and do as I ask. The scissors were sharp. I now use the electric gizmo for the beard but he still does sudden mouth movements and is just bloody lucky not to wind up like a Picasso artwork. PS – Gerard it has been peaceful here for months. Any reference to you know who is only done occasionally as ‘the dog walker’ when he makes some drivel comment on the Drum. Been too quiet. Shoe moved house but pops in every now and then, hph drops in very occasionally and VOR and Sea Monster just buggered off. Yes, hair is getting very square again. I think the unkempt tussled look is fading and the dyed bits at the hair strands ending is starting to come in. Of course, it adds to the cost. You are right about dyes, here are thousands of them now. Mine is still au natural but getting a dignified silvery tinge. I love your tonsorial piece, Gez. There’s something refreshing about a haircut, isn’t there. On the one hand I resent (a little bit) the spend – something that our dear women folk seem more than happy tripling or quadrupling in support of the German dyestuffs industry. On the other hand, I do like the breezy feel of a glabrous neck and unobstructed aural gear. When I was a pup, we used to go and line up at the barbers’ on a Saturday morning – first at East Hills and then at Panania. There was a slightly older boy than I who lived in our little street. He wasn’t the sharpest kid at school and I was surprised to find him not at school, but suddenly appearing as an apprentice barber. I gather what was then common – the shave with a straight razor – is now making a big come back amongst hipster barbers.